"Fans Law" will allow authorities to compile black lists of violent fans and create a stadium security corps. Russia has put into effect the a new law aimed at curtailing hooliganism among football spectators that will, among other things, prohibit spectators from bringing pyrotechnic equipment, coloring substances, anything of a political, Nazi, extremist or provocative nature, to stadiums. They will also not be allowed to hide their faces behind masks. The new law, dubbed the “Fans Law,” restricts also placards containing insults or obscene images at stadiums, and foreign-language signs must have translations that are notarized or otherwise approved by the event organizers. One of the primary innovations of the law is the compilation of black lists of fans. Stadium visitors accused of serious infractions could be banned from attending sporting events for up to seven years. Those violating the prohibition may be fined 15,000 rubles ($455) or jailed for 15 days. Amendments to the law place responsibility for disorderly behavior on event organizers. The penalty for the first violation is a warning; the second results in a suspension of operations. Significantly, the police, who currently maintain order at the stadiums, will be joined by the stadiums’ security corps – an equivalent of the football stewards now working in a number of European countries. A new surveillance system will also be used, the need for one being a popular topic lately because of the difficulty of identifying perpetrators in footage from stadiums. The new law comes after a wave of disruptive and potentially violent incidents at Russian stadiums during the past six months. In September 2012 the championship game between the Moscow Dynamo and Torpedo football clubs could not come to an end because fans threw smoke grenades into the field. In November of the same year, during a match between Dinamo and the St. Petersburg Zenit, a firecracker fired from the stands injured Anton Shunin, the Moscow club’s goalkeeper. There were highly publicized mass disturbances at a stadium in Yaroslavl, when Spartak fans clashed with the local Special Police Force (OMON), and a Nazi flag appeared in the guest stands. 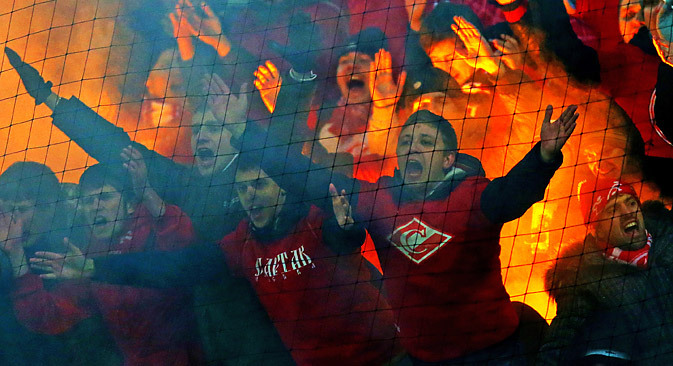 Before the law was enacted, troublemakers at Russian matches were very rarely identified, whereas law-abiding fans were dissatisfied with the actions of the “radical” fans and the harsh measures taken by the law-enforcement agencies. Mikhail Grushevsky, a well-known parodist and a CSKA fan, said he believed that such a law is long overdue, although he adds that penalties must be meted out individually rather than in a sweeping wholesale manner.